A male choir will sing popular Catalan songs at the Salles des fêtes des villages at 21h00. 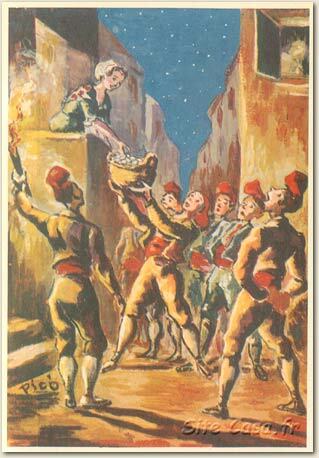 A tradition that dates back to the Middle Ages, the goigs dels ous” (or joie des oeufs in French) are traditional Easter songs, ancient hymns sung by choirs in traditional Catalan costume, signaling a return to life after the sadness of winter. Solemn choirs would wander the streets at night, and whole families would stand in their doorways and listen in fervent silence to the religious ’goigs’. Une petite fille regarde l’album de photos de famille. « Maman » dit elle « Qui est ce beau brun musclé et mince en maillot de bain à côté de toi à la plage? Ben alors, qui est le gros chauve qui vit à la maison?